I swam aggressively - lurching myself across with all my might. Arms fast, legs kicking straight and hard. Two lengths and I was out of breath. I watched someone else swim and remembered: swimming is meant to be long strokes, steady and smooth. That the goal is lengthening, pulling. That speed is born of efficiency, when it is done right. Apparently, I have no muscle memory for the sport. It doesn't come naturally to me. I enjoy the silence, the regularity. I like aligning myself with marks on the pool floor, emptying my head, going across. But, like running, I never lose the sense of the work of it. I do not slice through the water, torpedo-like and silent. Rather, my arm-paddles slap the surface and work against me. My feet follow, useless nubs attached to weighty logs that connect to my torso, which contributes precious little. We lived, before here, in south Florida. We were in a townhouse, the giant five of us (though the children were little, littler and littlest). It was on a school campus, a school known for swimming. Pool access was one perk. 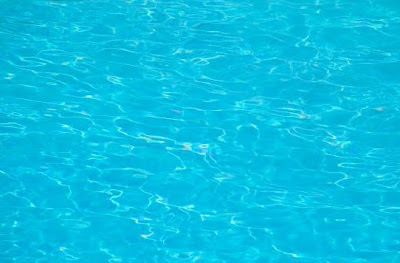 In an effort to 'get in shape,' I swam. I did so with a neighbor - my savior and advisor, Cheryl. She had coached swimming for a time in an earlier version of her, and she was amenable to coaching me. She talked me into it, as I recall. We swam first in the little pool. It seemed safer, but apparently suffered from a chemical imbalance. My arm hairs burned off and my hair turned a frizzy orange shade that sparkled oddly in the sun. Once I got pregnant, I wisely retreated from that pool. After that baby was born, Cheryl got me out again, coaxing me to move up to the Big Pool. I would tiptoe out of the house at 5:15, ever grateful for my time alone- careful to wake no one. I would vaguely hope Cheryl was not on her stoop, goggles and towel in hand, so I could return to bed guilt-free. Rarely did she comply. The big pool was Olympic-sized, diving depth, with a disarmingly distant pool floor when peered at through goggles. I never trusted the drop from where my feet could reach to where no feet could reach. Here, we were coached, at 5:30 in the morning, three days a week. Over time, I got to where I could swim many laps uninterrupted. Always at a pace slower than those around me, with a clumsiness that looked like defiance to the coaches who tried hard with me, to coach. I sometimes watched, one lane away, young Olympic hopefuls who had traveled from across the globe to train at my side. Inches from me, a Speedo-clad adolescent would barely flutter one chosen body part - an arm, or a leg - and slip effortlessly past me, as I put everything I had into some version of the common freestyle stroke. When I swam the follow-up rounds of laps tonight, some of the coaching came back. Head down, aligned, look at the bottom of the pool. Lead with one arm, pull with the other, meet in the middle. Pull arm in the water as far as possible until hand passes the waist. I felt the difference, and swam four more lengths, mostly uninterrupted. I dusted off faint instructions found on the shelves of my back-brain, and again tried to follow them. Feeling like an eight-year-old, I looked around for someone to watch me, tell me my movements made some sense. Shout, "good job!" I need to remember, once I get past tonight's insomnia, sleep, and wake again... to apply this metaphor to other things. Now, smelling faintly of pool chemicals at 2:30 in the morning, I remind myself: slow down. Take long strides. Head down. Lead, pull. Be patient. Don't imagine that work = speed, or efficiency. Be deliberate in actions: each time through is a chance for improvement. This seems to be a great site for Portable Pools, Plastic Pools,Water Footwear, Queen Airbed With Pump.I had been relying on http://www.togga.co.uk earlier and they too offered good stuff.